My first week of migraine medication detox began with a final dose of Amerge (naratriptan) and two Midrin after breakfast on Sunday, August 21. Despite a rough start, the week’s been surprisingly easy. * I feel better than I have in almost two years! Here’s how the week of detox went. A new treatment I’ve been using since June 22. It is a preventive treatment that can also be used acutely. That’s all I can tell you right now, but will share more as soon as I can. Day 1: Monday was the worst day by far. I was too nauseated and dizzy to eat breakfast until 1 p.m. and that required dosing with Zofran and Compazine. The pain, which felt cold and high on my head, hovered around a 4 and peaked at a 5, which lasted a couple hours. Ice exacerbated the pain. Thanks to Compazine, I slept from 2 p.m. to 7 p.m. I definitely had a migraine attack in the night and didn’t sleep well (probably because of the Compazine-induced nap). Day 2: I started Tuesday with a decent amount of energy and little pain. I even showered and did housework before eating. The migraine attack that followed breakfast was slight, but definitely present. Between it and the Compazine, I was laid up until I took a nap. Within 30 minutes of waking from my nap, I was perky and functional. I spent three hours working on chores and even did some writing. All with overcast skies! I once again had a migraine attack in my sleep, but it didn’t keep me up. Night sweats and vivid dreams were the only evidence that an attack happened at all. Day 3: I switched from taking oxytocin at night to taking it after breakfast on Wednesday. It was a remarkably good day. I slowed down for a couple hours after eating, but am unsure if migraine or Compazine was the culprit. I even ran errands in the afternoon. After dinner was the first time I felt like my new treatment actually aborted a migraine attack! It was also the first night in almost a year where I didn’t fall asleep minutes after getting into bed. Day 4: I woke up feeling fine Thursday and skipped the pre-breakfast Compazine hoping that I would be less sluggish without it. I used my new treatment after eating and it once again appeared to abort the migraine attack. I felt a little slow for maybe an hour afterward, but was able to write all day. My mind got a little fuzzy in the late afternoon, so I decided to rest. Before I did, I cleaned up a mess in the laundry room and put a coat of sealant on the bathroom tile… and discovered I no longer needed to rest. I finally stopped “doing” for the day at 7 p.m. The other big news of the day: I ate three meals instead of two! I can use my new treatment three times a day, so I wanted to see if it would abort all three eating-triggered attacks. It did! I then stayed awake the entire night. It wasn’t one of those maybe-I-slept-maybe-I-didn’t kind of nights. I read and did housework all night long. What kept me up? NOT having a migraine attack. I’m one of those fortunate folks who gets sleepy during an attack. After 17 months of nightly attacks, I think my body had gotten used to using migraine as a sleep aid. Day 5: Despite not sleeping one wink, Friday was another remarkable day. It was house-focused, including signing the paperwork to have the grass removed from our yard and replaced with waterwise plants. (I’m so excited!) And I finally fixed the mess created when shelves in the laundry room fell a few months ago. Nothing to write home about… except that having a day of normal chores is absolutely worth writing home about. Day 6: I felt great all day Saturday! I woke up at 8 a.m. and organized the house until 11 p.m. I didn’t even check Facebook. I slept well, too. Day 9: I spent this morning preoccupied with Sunday and Monday’s migraine attacks and obsessing over whether an attack was coming on. As I sifted through potential triggers, I kept worrying that my new treatment is backfiring. Although that is unlikely (I’ve been using it for two months with no problem), it’s my biggest fear, so it’s what my mind settled on. Other possibilities are that oxytocin is a trigger, I’ve developed reactions to some foods I thought were OK, or that merely touching cleaning product bottles now triggers attacks. I went with the oxytocin hypothesis and skipped my dose this morning. I’m going strong at 3 p.m., so I’m guessing oxytocin was the culprit. Future weeks: Medication overuse headache symptoms can last six months after the final dose. Given how easy my migraine medication detox has been and that I’ve only been using excessive amounts of medications for 16 months, I doubt I’ll have symptoms that long. Still, I’m hopeful that the next few weeks or months could bring even more improvement. Maybe I’ll one day be able to eat without having a migraine attack at all. 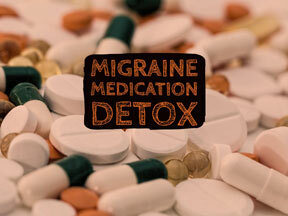 *My experience does not represent the typical migraine medication detox. It has been easy because of the preventives I was on before I started (and possibly because I was only in MOH for a year). The drugs I used as a bridge were ineffective—Compazine only made me sleepy and oxytocin made my migraine attacks worse. In the six months before starting the detox, my pain rarely got above a 4 and my most disabling symptoms were fatigue and cognitive dysfunction.